I have a mixed OS household: Mac OS X, Elementary OS, Windows XP, and a fairly powerful tower that was running Windows 8. I bought Windows 8 when Microsoft were offering a huge discount for early adopters at the beginning of 2012. I really don’t like it. Flicking back and forth between the new tile interface and the regular Windows look just doesn’t work well, and Windows 8.1 hasn’t improved much. Its one saving grace is that it is a very fast operating system. Because I bought an upgrade version, reinstalling it is such a chore. I first have to install Windows Vista, then I have to install Windows 8, and then I have to update to Windows 8.1. Stupidly, if you buy Windows 8, your installation code can’t install Windows 8.1, so you have to install 8 first. 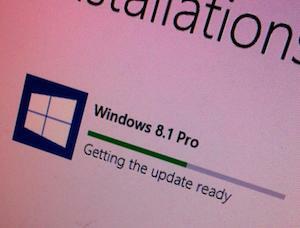 The whole process is a long, drawn out one, and then there are the subsequent updates to install. This really annoyed me, so I started thinking of an alternative. I could have just stuck with Windows Vista, but even installing that caused some problems so I began thinking about changing platform. Ideally I would love them to use a Mac. This would make my life so much easier; however, with so many computers in my house, it is not an option for financial reasons. So the alternative is Linux. I’ve used Ubuntu and various other Linux distros on and off over the years. Whether you can realistically switch from Windows to Linux will depend on your needs and what you use your computer for. If you need commercial software, then moving to Linux – or even Mac for some things – might not be an option for you. My kids tower is only used accessing the Web. The only things installed on it are a web browser and Flash plugin. It is used for Facebook, Flash games, YouTube, and looking up information. After finishing the move from Vista to 8 to 8.1 and installing all the required updates, I downloaded the 64-bit version of Ubuntu 12.04 LTS as well as Unetbootin and dug out my 2 GB SanDisk USB stick. Unetbootin is available for Mac, Windows, and Linux. I haven’t had much luck using the Mac version, so I commandeered a second Windows machine to create a bootable USB installer of Ubuntu. I shut down the Windows 8 computer and disconnected the hard drive. I had a spare hard drive and installed it. In case I want to run Windows again, I thought a spare drive would be easier. I know, I could have dual booted, but I wanted a hassle free approach. I’ve had enough computer headaches lately. The computer is a 2 GHz Core 2 Duo tower with 3 GB DDR2 RAM, 80 GB drive for Windows and 20 GB drive for Ubuntu, ATI Radeon HD 5450 PCI express graphics card, and 15″ flat screen monitor connected via DVI. Not exactly top of the range, but hardly low-end. Once the USB stick was created, I simply choose it in the BIOS boot options, and within a minute I was faced with a “live” desktop – this is a working OS running from the USB stick without touching your existing operating system set up. It is a great way of trying out a Linux distro to see if you like it. If you are happy, you then run the installer. Then simply answer a few questions, such as time zone, keyboard, and user account setup, and then sit back and watch it install. You can even have it download updates while installing and install third-party non-open source software such as MP3 and Flash at the same time. It took around 20 minutes to run through, and then I was asked to restart. No installation code is needed. No activation is needed. Just install and use. It makes a nice change from having to insert a long code and then activate it – only to find it failed and needs to be done over the telephone. 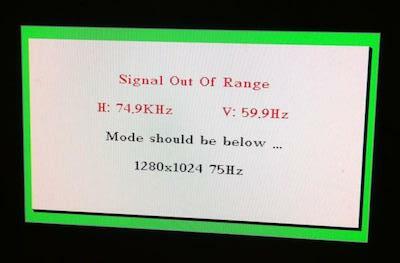 On reboot, my monitor decided to go on to standby after the Ubuntu splash screen displaying ‘signal out of range’. This isn’t a Ubuntu specific issue; I had this before on this machine running Windows Vista and using an nVidia graphics card. Official nVidia and ATI drivers seem to cause problems for this monitor. To fix this issue, I had to seek advice from a Linux friend, Carl Draper, who pointed me to a Ubuntu Community page for ATI graphics cards. I had to use a command line to remove the fglrx driver. On reboot, the problem was resolved. Ubuntu does an amazing job at hardware detection. All hardware was detected during installation without asking for anything or needing a single driver including ethernet connection and sound, which Windows always struggled with. The second thing that struck me was the update process. One run of the Software Update, and it pulled in 260 MB of updates and installed . Each time I rebooted and ran Windows Update, it found a whole bunch of new updates. In total, it pulled in almost 200 updates. 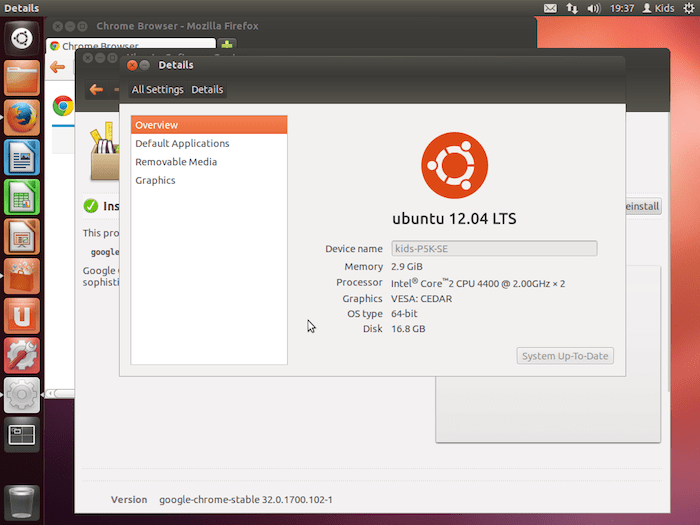 Within an hour of starting the Ubuntu installation, it was done and updated – including sorting out the graphic issue. Despite it being installed on an old hard drive, the speed is very impressive – easily comparable to Windows 8. The OS loads in under a minute and is ready to use almost instantly. Firefox is already installed, but I decided to install Chrome too, due to Adobe abandoning standalone Flash for Linux as of version 11.2. Future Flash will be handled via Google and its Pepper-based version inside Chrome. As a user of Firefox, this annoyed me a little. I have never been keen on Chrome, but it is actually very quick in Ubuntu. A huge bonus of using Linux is no need for a security suite. Installing anti-virus or anti-malware just isn’t needed and is a welcome change over using Windows. As with the Mac world, I am sure if Linux popularity grew large enough, then a virus threat could be a real possibility. At present it is possible to receive a Linux specific rogue attachment via email, but it would need to be targeted to your Linux distro – and you would need to physically run it. Malicious sites could trick you in to thinking it is a genuine site, but this isn’t Linux specific. A Linux anti-virus suite is very similar to a Mac OS X one. It is there just in case and to protect our Windows friends. But speak to any Linux user, and I bet they have nothing installed. Running Ubuntu instead of Windows prevents my kids from installing countless pieces of junk. Yes, I know there is the Software Centre, but it is a fairly controlled environment with checked software. Install a simple tool on Windows, and it can bring with it toolbars, additional software, and change your browser homepage and search settings, which can be pain to get rid of. Being a Mac user, I am used to not relying on Microsoft products. I am also used to coming across software that even now doesn’t support the Mac operating system. While Mac has a lot of commercial packages these days, Linux in the past few years has also increased in popularity with commercial developers, bringing mainstream software and games to the Linux platform. This can only be a good thing, enabling Linux become a viable option for the average user. My kids are all under the age of 11 and don’t follow in my nerdy ways. They just want to use a computer rather than know how it is built or how it works. Which operating system it is running really doesn’t bother them. As long as it does what they want and they can find Firefox or Chrome, that is all they care about. I love Mac OS X. It is an amazing platform, but keeping up with Apple is not always an easy thing to do financially. I couldn’t switch to Windows, but I would definitely move to Linux if Apple weren’t an option. I had a brief spell in 2010 where I left the Mac world and moved to Linux, but I couldn’t keep at it. I was using older hardware, but the experience was good. With newer hardware and newer distros, the experience would be totally different. Linux is closer to Mac than Windows is, so for a Mac user it isn’t a huge leap. As an iOS user, I would find the move to Linux a little tricky. While an iPhone will work with Linux, it is not as slick and integrated as with Mac OS X. Perhaps if I changed my mobile platform, then my desktop platform could change too, but I don’t see myself changing either anytime soon. Pros of using Linux: no cost, no installation code, no activation, community support, safe and more secure, ability to check it out via a Live version, varying distros aimed at older hardware. Cons of using Linux: you have to make your own installer via DVD/USB, less commercial software and games, less hardware support/drivers, requires a deeper knowledge of computers. So far so good. The kids are happy with it, and I am happy in the fact that it is a secure OS that they can’t mess up. Installation was a breeze, and so was setting it up. I have two older Packard Bell laptops that are currently running Windows XP that I might switch to Linux if this experiment with Ubuntu goes well. It could mean the end of Windows in my house altogether. I don’t think you have to install vista first to use the Windows 8 upgrade disc. The disc should give an option for a custom install, which allows you to do a clean install. When it asks for a product key you enter the key for vista from the sticker on the computer. About 5 years ago, I was managing a public school computer lab with 32 WinXP systems. Servers at my school board were infected (with Conficker) and the school district announced that all computers were to be shut down waiting for district IT staff to come and check each system to make sure they were virus-free (and to install anti-virus software). Instead, I created 32 Ubuntu live-CDs and booted all my lab’s systems to Ubuntu. I was interested to see how the students (age 5-12) and staff would react to the different user interface and operating system – and how much help they would need from me in order to adjust. Reaction was pretty positive – with very little help from me needed… perhaps in part because my Win XP systems all had Firefox icons on the desktop – so users were used to having the option of using Firefox for web browsing; since the same icon was easily accessible in Ubuntu, all was good! Ahhh, Conficker. It got onto our districts network when I was doing IT work for them one summer, helping them with massive upgrades to their systems. It was our own fault as our testbed machines didn’t have AV software on them as we were going to image them again anyways. That thing was hard to kill, we had to slipstream the patch for it into our install so all new images would be safe from it. I just tend to keep my lowest end computer permanently installed with Win7, and pull it out whenever I need something windows-specific– usually android Rom flashing. But I’ve recently discovered a new love for Linux– reviving my dying first gen Intel Imac! Currently using rEFInd and dual booting Ubuntu 13.10 and Snow Leopard. It’s really hard to choose one on booting up–I tend to give each one equal play. Snow Leopard really is better for music, but Ubuntu has been holding its own lately. Simon- I switched from the Mac to Linux as my main OS in 2011. I used Ubuntu 11.10 for a long time, along with Windows 7. Then I accidentally erased my hard drive and decided to just start over with only Linux Mint. It’s just about perfect. What I’ve found lacking (and making me want to go back to the Mac) is the lack of video purchase support. Netflix doesn’t work (without a lot of fiddling), I can’t watch video I buy from Google Play (even using Chrome! ), and so on. I was hoping that Google Play Movies would be the answer to legally purchased videos for Linux users, but it hasn’t happened yet. (As a side note, you can’t even download video from Google Play to your computer anyway). @Simon – I keep thinking about installing Linux on an old PC for my children. After reading your article on Elementary OS, I did some research and that seemed to be a good option. I am curious as to why you went with Ubuntu this time rather than another install of Elementary OS. Thanks!